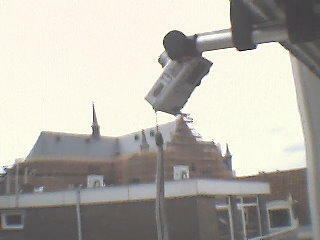 Here are some webcam pictures of the equipment of Cospar station 4352 Leiden, the actual SatTrackCam. See also my detailed SatTrackCam website. 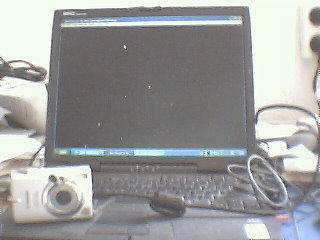 As you can see it is actually quite simple: a lap-top, a Canon Digital Ixus 400 digital camera, and (not shown here) a DCF77 radio controlled clock for accurate time keeping. The station's geographic coördinates have been obtained by GPS.